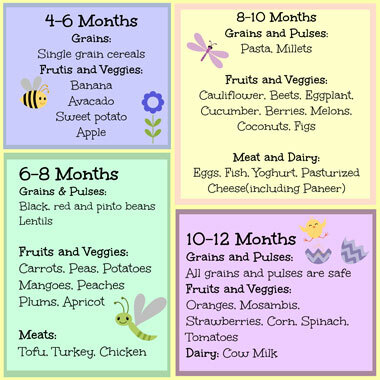 Are you confused on what foods to give your baby as he/she is growing? Introducing solid foods to your baby is a huge milestone. Here are some healthy and yummy recipes for your child. Click on the name of the recipe that you like. Try not to feed solids for dinner. Feed your baby a fruit or vegetable puree in the evening instead. You can start giving your baby a combination of 2 solids (2 fruits, rice and dal etc). Continue feeding your baby banana and avocado as well. Once your baby reaches this age, he/she may start eating 3 meals of solid foods in a day. He/She may also enjoy evening snacks. Once your baby is around 9 months old, you can introduce a lean meat like chicken. You can introduce your baby to fish. But be extremely careful while feeding and make sure that every single fish bone has been removed. By now, your baby is almost ready to eat adult food. You can introduce small amounts of spices to your baby’s food. How will these foods help your child?? Did you know that cereals have almost 60% – 70% starch? This makes them an excellent source of energy. Rice is almost an an allergen-free food. Vegetables like carrot are high in Vitamin A and Beta Caratone. Veggies are an extremely good source of Fiber for your little one. Milk is considered as a “SUPER FOOD” due to it’s high content of all vitamins and minerals. Building and maintaining tissues and organs. 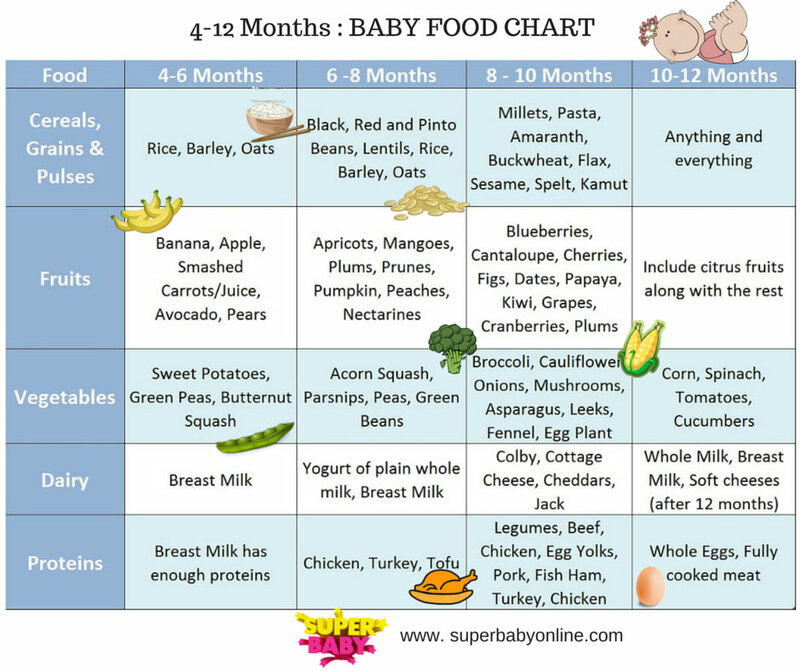 Here’s is a Food Chart for your baby. Note:The American Academy of Pediatrics recommends that a baby’s main source of nutrition should be Breast Milk until at least 6 months of age. However, based on the child’s readiness, many parents start their baby on a solid food at 4 months of age. Thus, we have included it in this simple food chart. Make sure that you consult your child’s pediatrician before introducing any new food to your baby. Whenever you introduce a new food to your baby, it is always advisable to follow the four-day-wait technique. Do not introduce a new food in your child’s diet withing 4 days of introducing a food. Morning or early afternoon is generally the best time to introduce a new food. Some foods break down very slowly, thus causing gas in your baby. Try not to feed these foods at night.